I’m not even a Pokémon fan (I’m old), but this looks really fun. Detective Pikachu is a pretty amazing idea for a movie that might have one serious, film-ruining idea right at its very core. Ryan Reynolds as the voice of Pikachu could be a disaster. I’m not opposed to having a Pokémon speak English, and the film goes out of its way to establish that most of them still speak the name-based baby talk they’ve always been known for. But giving Pikachu the cynical, wiseacre voice of Deadpool doesn’t make any sense. 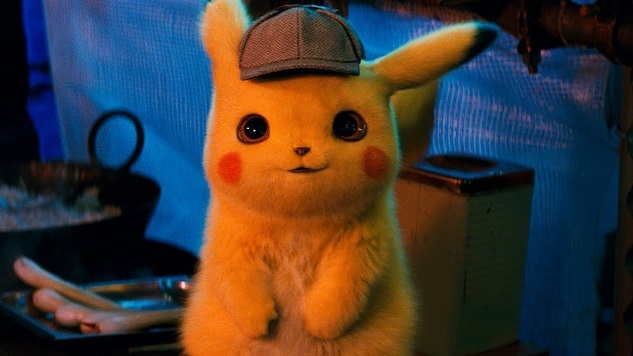 Even if this Pikachu is supposed to be a hard-boiled detective, there should still be a sweetness to him, a childlike quality that reels us in, only to amplify the impact of his electrical powers and make it mean more when he loses his temper. Obviously this Reynolds version of Pikachu won’t be swearing up a Deadpool-like storm, but PG snark is still snark even if it’s rated PG, and it’s still inherently prickly and unlovable. There’s only one thing I actually hoped to see out of this movie, though, and this trailer makes it seem more possible than I ever actually imagined. There’s only one Pokémon who could ever be Watson to Detective Pikachu’s Sherlock Holmes, and that’s obviously Pysduck. I’ve written before about how Psyduck is a universal symbol for the human condition, and that still holds true. If Watson is a stand-in for the reader, an everyman for Holmes to explain his logic (and thus the story) to, there’s no Pokémon better suited to fill that role than Psyduck. Shockingly, Psyduck appears in this trailer more than any other Pokémon except Pikachu, even at one point riding in a car with Pikachu and his human handler. Psyduck’s clearly going to be a sidekick of some prominence (even if he’s just a human sidekick’s sidekick), and that has me more excited than anything else about this movie, which will be out on May 11, 2019.